Yes it's in the service manual. I'll send you their location in PM. Hi also interested in this pls. I lost hotkey control of brightness when I swapped to an LG IPS display running eDP cable on my P377-SMA and was using the reg key to control brightness via windows. Can you pls send me the info on which jumper to flip? 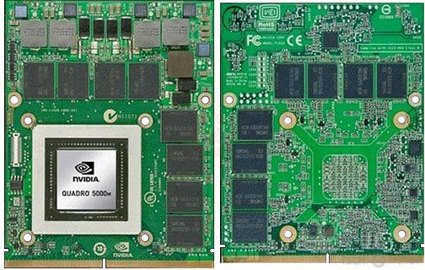 Its going to take some clever tricks to fit the die within MXM 3.0B or even MXM 3.1B specs as RTX dies are huge. It should actually be relatively easy to do so. If you ever break apart a GTX 1080 or RTX 2080 desktop you'll notice that a lot of the parts are somewhat lackluster, poor quality capacitors, lower quality VRM, etc. Than their MXM counterpart in the GTX 1080. The large power Mosfets alone on the MXM version are about 24$, and from TI. Even moreso the smaller components like the depletion and gain mosfets, which actually are pretty scant, are exceedingly costly. The PCB is also 12-18 layers (could not really tell the depth). That leaves me to believe that it isn't a matter of fitting on the MXM form, rather it is an issue of providing quality components. Those desktop cards themselves are effective because they can sacrifice quality for area. In addition to that, most laptops route signal chains to a on-board decoder instead of relying on a GPU board based one. Fermi fit onto the Mxm form pretty snug, but the size of even the 2080 RTX is barely 16mm² larger. It might explain however why the 2080ti isn't on the series for Mxm GPUs at least not yet coming in at around 750mm². Additionally, it is possible to reroute the currents needed to smaller channels without much issue. In fact that probably more of the reason. We might see a 150w 2080. ExMM, jaybee83, long2905 and 1 other person like this. Just today, on one of the polish sites, appeared kind a teaser of their upcoming review of the new Clevo barebone based on P775TM1-G with i7-9700 and RTX2070. You can see there exactly how the card looks like. dzpliu, Ashtrix, Khenglish and 3 others like this. Don't bother waiting for GT63's MXM card anymore. I guess it is just Clevo-style or MSI New style MXM left.